Mutsy originally started out as Mutsaerts and has been in business since 1937. It is a Dutch company and is a long time sponsor of Casa Materna – a birthing center in Nicaragua. The company started selling in the USA in 2007. It is a luxury version of the standard 4 Rider and has the classic Mutsy profile. It has a minimalistic look. The stroller comes with a seat but not a bassinet (bassinet is optional). The tires are pneumatic for extra comfort and the single spoke wheels look stylish. 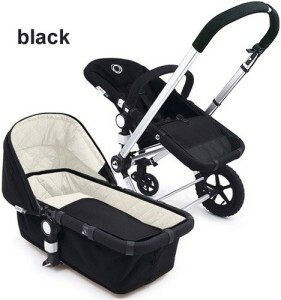 It is simple to exchange the seat for a bassinet and the stroller easily adapts to a travel system with an adapter making moving your baby between car and stroller very easy. It has an aluminum frame and the seat can be reversed. Front swivel wheels provide the stroller with great maneuverability. The 4 Rider Next is compatible with some car seats when purchased with the appropriate adapter. It is available in 18 colors. The main difference between the Mutsy 4Rider Next Stroller and the normal Mutsy 4Rider is that the handlebar is covered in leather. The swiveling frame combined with the large 12″ wheels provide a very smooth ride. It is very easy to push even though this is a heavy stroller and it steers easily. 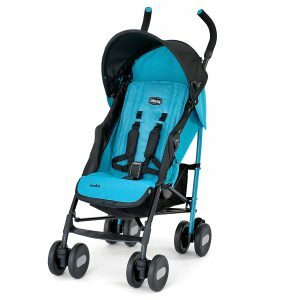 Smaller wheels in the front would leave the stroller more maneuverable but overall the larger front wheels work well on all other terrains – including sand. Folding is easy and can be achieved with only one hand. The stroller will fold with the seat attached but only if the seat is facing forward. The folding process requires you to pull up on the safety grip on the handle and also press the lever on the side of the handlebar while pressing down on the handle. 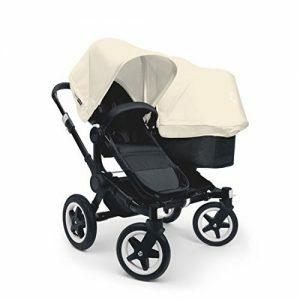 It folds very easily while the wheels remain on the ground and none of the stroller fabric will touch the ground. The seat has lots of padded nylon and the fabric is very easy to clean. It is easily reversible and has a multiple position recline. Unlike some strollers, the seat on the 4Rider Next will recline to a totally flat position (not a “V” position like some other strollers). The depth of the seat is adjustable. It has a 5-point safety harness and the buckles are very easy to use. The clip system for removing the seat is really easy to use so removing the seat is a breeze. The seat has a huge hood that has a viewing window built in. The seat has a bumper bar which can be replaced with a dinner tray (optional). The foot rest is adjustable. With the proper adapters (sold separately), the stroller can take the Graco or Maxi Cosi car seat. 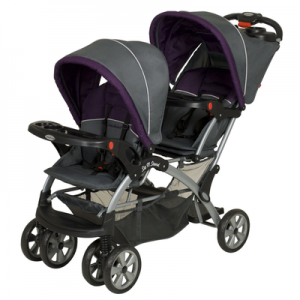 The stroller will fold flat with the seat or bassinet attached. The canopy is very big and will protect your child from all of the elements. There is a viewing window at the rear. Unfortunately, shopping space is limited. The cargo area below the seat is very small. The 4Rider wheels are large and are air filled (pneumatic). This provides a very smooth ride for your baby. The large tires will go over bumps and hollows much easier than smaller wheels. The front wheels swivel and this makes steering very easy if you are going shopping. The brakes are foot operated and very easy to use. The pedal is large and easy to reach. However, you do need to use your toe to release the brake and this may scuff new shoes. This is a pet hate of mine. 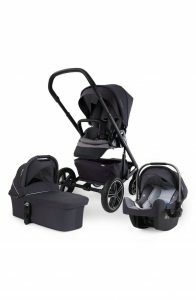 The 4Rider Next stroller is a luxury stroller but it is not as expensive as most other luxury strollers. When we carried out the Mutsy 4Rider review, we found it comparable to the Bugaboo Cameleon 3 but it is cheaper than the Cameleon. Mutsy is still relatively new in the USA and as such this stroller will make you stand out from the crowd. 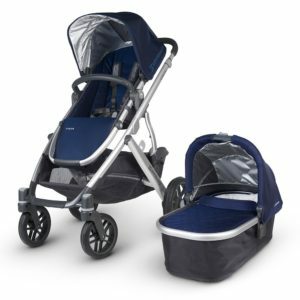 It is easy to convert this stroller into a travel system and the large wheels make it usable over most types of terrain. However, this is a heavy stroller (most luxury strollers are heavy) and the Bugaboo Cameleon is lighter.